This frame snaps in half for easy wringing. Greater area of mop on floor compared to normal cotton mops. It can be wrung out in normal wringer bucket or flat mop roller wringer smart buckets. Use the colour coded Scrub n Dry covers for specific areas. For cleaning washroom and dirty areas that require scrubbing and to leave floors as dry as possible. 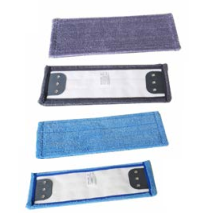 These covers will scrub through grime and are available in washroom and general colours. For heavy duty cleaning or for cleaning non slip floors. Made from rubber and strong, hard, durable plastic, these lamps are spring loaded for secure storage. The pincers of the holder mechanism grip your tools fast, and are made from hardened rubber for a tight hold and secures even the smoothest of handles. Available in 5 colours: blue, red, green, yellow and white. 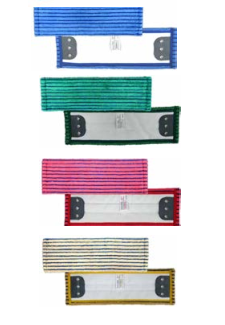 Hold one or many Tidie Multi-Fit handle holders on your stainless steel Tidie-Rail. Available in 50cm or 90cm lengths. The Tidie-Rail has two lips; top and bottom that fit perfectly to the tongue-and-groove design of the Tidie Multi-Fit handle holders, so that they slide easily and securely. Get started with the Tidie Handle Holder Starter Pack, including a 50cm Tidie Rail, and one Yellow, 1 Red, and 1 Blue Tidie Holder. 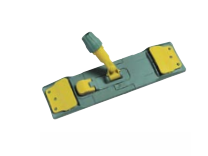 Ergonomic door wedge, hand held or on a handle, easily fits onto your trolley and allows you to wedge open doors where required without bending.